Nature, wild animals, birds, rainforest, amazing views… What a beautiful day in Gamboa, less than one hour away from the city! Asociación Panamericana para la conservación (APPC) center rescues threatened wild animals finding in the middle of the jungle to save, care and heal them all year long before putting them back in their territory. The owner, his wife and all the volunteers are really devoted to their job, and they will explain you with commitment and passion what their work consists in and how do they help these animals, but also what happened to them, how do they live, and even some touching personal experiences. You will learn why a sloth is that slow, but also that they can usually live 15 years in nature against only some weeks or months, in captivity! You couldn’t touch these little lovely creatures in order to not scared them but you will be so close that it’s going to be the same! And as me, you will for sure, enjoy taking some selfies with sloths! You will also love meeting the famous and gorgeous jaguar Fiona, rescued at the age of 3 months! Note bis: Some volunteer experiences are available at APPC Center. Under a beautiful and hot sun, we have boarded on an aerial tram in the middle of jungle where we discovered and learned a lot about wildlife and nature with our guide. We had the chance to see wild sloths grabbed to trees, impressive ants’ nests but also amazing views of the jungle and canal while we were going up. Once up, like us, you will enjoy to climb on the Gamboa Tower and chill out for some time to admire this beautiful view! End your day by three wonderful and rewarding exhibits. One about orchids and gorgeous flowers and plants you could find in Panama. The guide will make you smell some herbs, and you will probably smell one which seems to be chicken…! Really weird for plants, but true story! Then, enjoy looking at these little colored frogs in a private greenhouse. Definitely cute yes, but from far away! These little animals are indeed venomous and better not meeting them on your way. To end, let’s discover this lovely and relaxing butterfly house. Hundreds butterflies were flying above our heads, and we could watch them feeding with some mixture especially prepared for them. Learn the process from their eggs to their transformation in butterfly. It’s always so impressive to learn about how the Nature works and what she is able to do… Did you know that the butterfly lifetime is about one month? Did you also know that when a butterfly’s egg becomes black it means that it has been infected by another insect or mosquito which would have put some venom inside? And that this egg will actually become the insect or mosquito in question later on? Really fascinating…! After this instructive and enjoying day, your driver will drop you off to your hotel in the city, and as us, you could take some time to look at your beautiful pictures of the day! If you are staying in Gamboa Rainforest Resort try visit APPC. Almost finishing the high season I was invited to go on one of the tours from EcoCircuitos: This time I was able to go on the Embera Tour. This tour will take you to an indigenous community and this brought me some memories that I will cherish the rest of my life. We departed from the Gamboa Rainforest Resort to drive to Chagres National Park to enter the boats. Upon arrival at the boat entrance, I met some people of the Embera community that would take us by boat to their small village. The men were dressed in colourful skirts or they were just wearing a loincloth. Although they speak their own language, I understood immediately that they had lots of fun about my height and my blond hair. These people are so friendly and very proud to show us their small village. The boat trip was an adventure on its own. We werefloating in long tail canoes that took us through the rain wood. 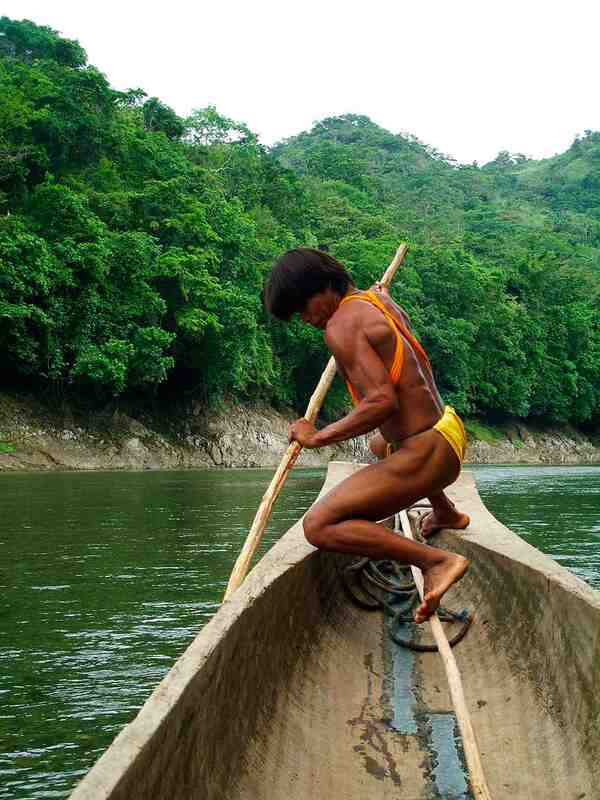 Sometimes the water was so low that the men had to push the canoe through the water to continue our journey. During the boat trip we saw some amazing birds and some of us saw a crocodile. We enjoyed the beautiful nature of this area and enjoyed the boatride through the river. The community will make sure that you feel comfortable during your trip. Once arrived, the community greeted us their own cultural way. They were making music for us and everyone was playing an instrument. Even the little kids were greeting us their original way which made us feel warm and welcome. The guide Fabio explained us about the village and how the huts were build. Furthermore he told us about the nature, the people and their culture. Wehad the opportunity to take a look around at the village and enjoy the friendliness of the community. Furthermore there were some handcrafts for sale and communicate a bit with the community. The community gave us a presentation about their culture, their way of living and their norms and values, all translated by the guide Fabio. Furthermore they showed us their typical customs and I got inked with Jagua. Thisblack inked is coming from plants that are growingin that area and it will stay on for more or less 2 weeks. The Embera will paint you with this Jagua and you will have a temporarily souvenir. During the presentation lunch was served. Lots of fresh fruit, platano and fish was served. It was delicious. It think it tasted that good because it was made by the Embera community with care and love. 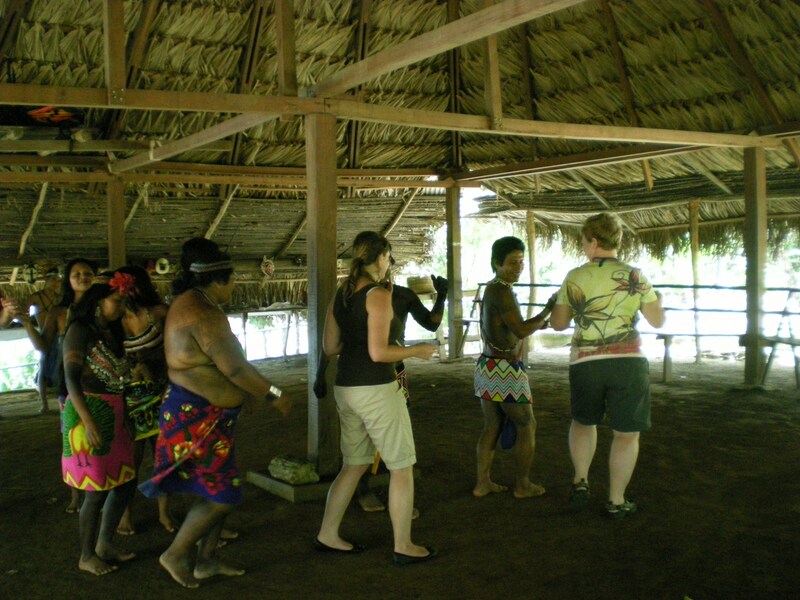 After lunch the Embera women performed their traditional dance and invitedus to dance with them as well. The men played their instruments and it was great to be interactive witha community that is so different from the life style that I am living. I don’t speak their language and they don’t speak my language but we did understand each other. Furthermore the oldest man from the community and besides that the chief of the community, took us for a shorthike in the rainforest to his medical garden. He explained us about these plants in this garden and he told us thathe has been helping lots of people because of his medical plants. It was very fascinating to listen to his stories and we were able to smell and taste some of his plants. Finally we returned by boat under good care of the Embera to the entrance of Chagres National Park and saidgoodbye to the people of the community. We could not stop waving to each other when we finally drove a way to Panama City. These people will stay in my memory forever. Luckily I had the chance to join an exciting EcoCircuitos tour to the indigenous village of the Embera Drua people to get to know their lifestyles and traditions. Accompanied by a great naturalist guide we started our trip with a ride through the Canal Zone and the nice Soberania National Park where we even saw a small anteater on the street. 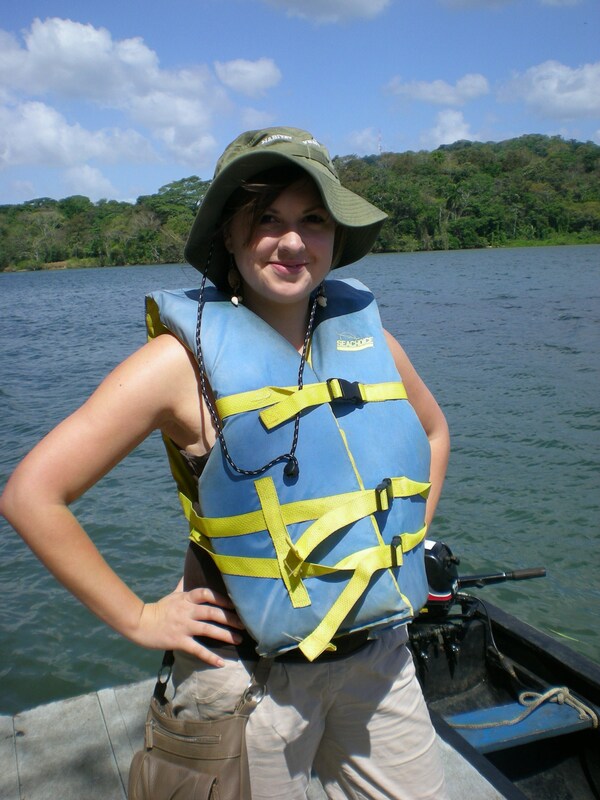 Arrived at the bank of the Chagres River we boarded a motorized piragua (dugout canoe) with an indigenous guide and captain and traveled the Gatun Lake to the communityt. We had a stop for a small hike of the botanical trail “Venta de Cruces” off the community. This forest was full of interesting trees, plants and small animals like the rana hoja, a frog that looks like a leave and is very well camouflaged. The indigenous guide explained us how the trail was used and showed us many different plants. He described how these plants were applied and still are nowadays, for example for medical purposes. After the small hike we continued our boat tour to the village. While enjoying the view out of the boat over the river and the nearby forests and the refreshing water that spilled over to us in the boat from time to time we reached the bank where the Embera village is situated. Our arrival at the “dock” was accompanied with local music and we were welcomed very friendly. After some time of enjoying the marvelous location and the view of the river we were given a presentation about clothing, handcrafts and other traditions and lifestyles by a young representative of the Embera community. Most of the arts and crafts are made of natural resources like seeds, leaves and different kinds of wood. Then we even had the pleasure to have a traditional lunch which existed of delicious fried plantain and fish, followed by fresh bananas and pineapples as desert. After this yummy lunch the Embera women showed us a really fascinating dance accompanied by interesting traditional music presented by the Embera men. We were even invited to join the dance and learn some steps; this was really exciting and fun! After this program we had the opportunity to explore the village and the surroundings a little bit, of course in way that does not disrupt the daily life of the community. By doing so we could also buy some of the beautiful handcrafts made by the Embera. I was very pleased to hear and to see that the local community really benefits from tourism and this is a way for them to demonstrate their traditions and sell their self-made products. As this community lives in the Chagres National Park, thus a protected area, they are not allowed to hunt, to cultivate fields and use the wood of the forest to keep their farms. Therefore it is a great opportunity that they profit from tourism as they welcome regularly small groups and thus they have the opportunity to sell their handcrafts like nicely designed plates, small statues, neglects, bracelets and much more. In this way they do not only preserve their traditions but also conserve and preserve the nature around them. I really enjoyed this adventure, the people were really friendly and open-minded and I learned a lot about the life in the Chagres National Park. It was a pleasure for me to get to know the Embera people and I am really glad I had this opportunity. Thanks for this great, exciting, personal and very unique experience! EcoCircuitos Panama is more than pleased to invite you to enjoy Christmas Holidays in our unique country. Get to know our history and the Panama Canal; have a cultural encounter and get to know the Tropical Rainforest during Christmas time!!! Day 1, December 20, Welcome to Panama At the appropriate time an EcoCircuitos Representative will be waiting for you at the Tocumen International Airport for transfer to the Hotel. Once arrival, please check in and overnight at Country Inn Dorado, Junior Suite Room. Day 3, December 22 The Caribbean Side; the Kuna Kingdom an Indigenous Encounter – Today very early in the morning you will be transferred your hotel in Panama City to Albrook Domestic Airport to take your flight to San Blas. Once arrival, you will be met by a representative from the lodge for your boat transfer to the lodge. Check-in and overnight at Dolphin Lodge, Uaguinega. Standard Room 1 Day tour included to a nearby island for beachcombing or snorkeling (gear available for rental). All meals included. No drinks or water included. 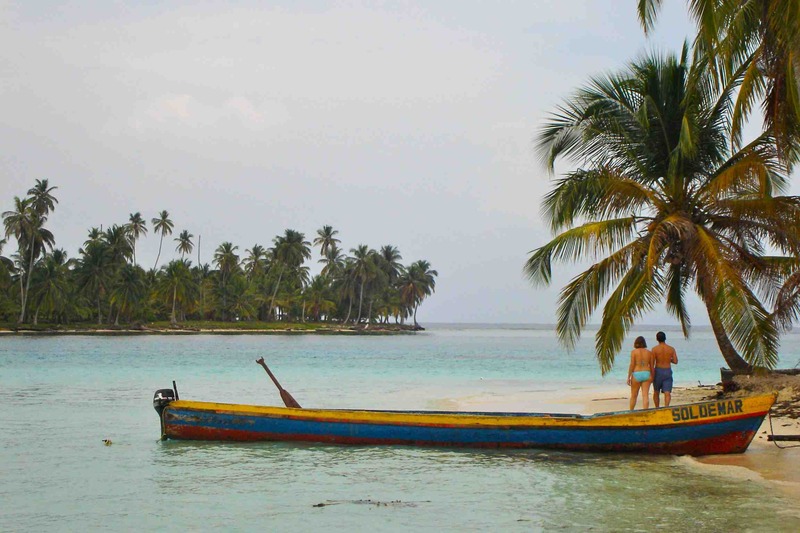 Day 4, December 23, San Blas Islands, Dolphin Lodge – Days to enjoy at your leisure on the island, taking it easy or visit with the local Kuna Community. One day tour is included. 1 Day tour included to a nearby island for beachcombing or snorkeling (gear available for rental). All meals included No drinks or water included. 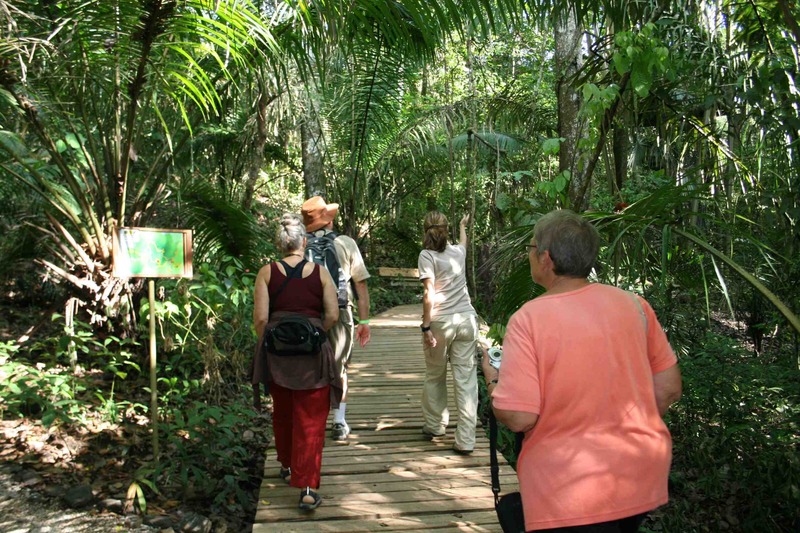 Day 5, December 24, The Rainforest Experience, Gamboa Rainforest Resort At the appropriate time, transfer to the local airstrip for your return flight to Panama City. Once arrival, transfer to the local airstrip for your return flight to Panama City. At the appropriate time, transfer to the local airstrip for your return flight to Panama City. Check-in time is at 3.00PM. Arrival to Gamboa Rainforest Resort; where you will stay for the next 2 nights in One Standard Room. This resort features Gatun Lake tours, an aerial tram ride through the forest canopy, animal exhibitions and more. Day 6, December 25, Gamboa Rainforest Resort – Free day Breakfast at the hotel Day to enjoy at your leisure exploring the area or relaxing in the hotel’s spa, pool or on Gatun Lake. Optional tours include: Arial tram, night tours, birding tours, boat tours, kayaking, fishing.